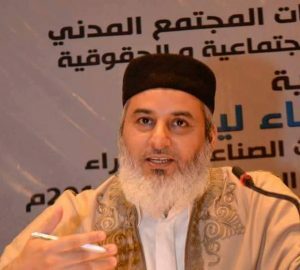 There are reports in Tripoli today that Sheikh Nadir Al-Omrani , the associate of Grand Mufti Sadik Al-Ghariani who was kidnapped in Tripoli on 6 October has been murdered. A man named as Haitham Al-Zintani was shown on a video made by Tripoli’s Criminal Investigation Board (CIB) and published on its Facebook page apparently confessing to his role in the Sheikh’s abduction and subsequent killing. It is alleged that the murder was an act of sectarian rivalry, carried out by supporters of Saudi cleric Rabee Al-Madkhali in the south Tripoli suburb of Esbiaa and allegedly linked to the Rada (“Deterrence”) forces. In the video, Zintani claims that a colleague had put Omrani in a hole in the ground and after accusing him of misleading the public with supposedly false religious views, had shot and then buried him. In a potentially explosive development, he claimed the head the Esbiaa branch of the anti-crime board was the man who killed Omrani and its premises as the place where he was held for a month and then murdered. He also alledged that Omrani, a member of Ghariani’s Dar Al-Ifta, had been chosen because his Salafist version of Islam was different to that of Madkhali, that the kidnaping and murder had been planed three months in advance, and that it had been ordered by a top Egyptian Madkhali cleric and agreed by the group’s mufti in Libya. Other Dar Al-Ifta members were also supposedly on a death list. Madkahli supporters are known to be ideologically opposed to Ghariani and his followers. It is also claimed that they include numerous members of the Rada forces led by Abdulrauf Kara. In a statement this afternoon, Rada denied any involvement in Omrani’s death and promised to track down the killers. For its part, the Dar Al-Ifta Dar Al-Ifta has called for Omrani and others allegedly involved to be punished as soon as possible, describing them as “deviants”.